•What is the Fairfield Advantage? •If you build it, they will come. Fairfield County was recently featured in the February 2016 edition of Business in Focus magazine. This magazine is distributed to more than 350,000 subscribers across North America. Its main subscriber base is business executives scattered throughout North America. 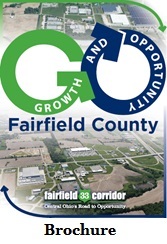 The article highlights the many benefits of doing business in Fairfield County; as well as the current. Lancaster, Ohio - The Fairfield County Board of Commissioners are pleased to announce the appointment of Rick Szabrak as Fairfield County’s Economic Development Director. The appointment is effective January 4, 2016. Mr. Szabrak is a graduate of Miami University with an MBA from Northern Illinois University. He has been employed by Gannett Co. since 1996.